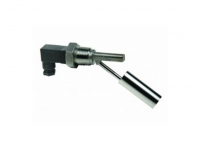 This all stainless steel level switch is horizontally mounted to give either a high level or low level signal and is reversible meaning that it can be either normally open or normally closed. The RF-MH50C has an all 304 grade contruction and the RF-MH56C is constructed from 316 grade stainless steel. The switch comes with mini din connector.